ww2dbaseEdmund Tyler Wooldridge was born in 1897. He graduated from the US Naval Academy in Annapolis, Maryland, United States in 1920. In the early 1920s, he served aboard battleship USS Delaware, light cruiser USS Galveston, and minesweeper USS Chewink. Between 1923 and 1924, he attended the submarine school in New London, Connecticut, United States, and then served aboard submarine USS S-36 until 1928. He married Marion Lee Johnson. In 1928, his son Edmund Wooldridge, Jr. was born; his son would follow his footsteps into naval service upon reaching adulthood. 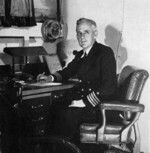 Between 1929 and 1932, he was an instructor at the US Naval Academy. Between 1933 and 1934, he served at the Hingham Naval Ammunition Depot in Massachusetts, United States. In 1935, he served at the Panama Canal Zone. Between 1935 and 1936, he was attached to the Naval District Washington at the US capital city. Between 1936 and 1937, he served aboard destroyer USS Tattnall. 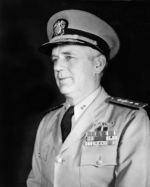 Between 1938 and 1942, he was a staff officer under the commanding officer of the US Atlantic Fleet; during this time, in 1939, he was promoted to the rank of commander. Between 1943 and 1944, he was attached to the Bureau of Naval Personnel; during this time, in 1942, he was promoted to the rank of captain. In Jan 1945, he was made the commanding officer of battleship USS New Jersey; in this role, he saw action at Iwo Jima and Okinawa, Japan. In late 1945, after the end of hostilities, he was made the commanding officer of Cruiser Division 16 based in northeastern Japan, holding that role until 1947. Between 1947 and 1950, he was the Deputy Chief of Naval Operations based in Washington DC. Between 1950 and 1953, he oversaw destroyer operations with the Atlantic Fleet, followed by a similar role with battleships and cruisers for the Atlantic Fleet between 1953 and 1955. Between 1955 and 1958, he was attached to the US Second Fleet. Between 1959 and 1961, he represented the Joint Chiefs of Staff on the National Security Council. He retired in 1961 and passed away in 1968. He was buried at the US Naval Academy Cemetery in Annapolis, Maryland, United States. 5 Jan 1897 Edmund Wooldridge was born. 1 Jul 1939 Edmund Wooldridge was promoted to the rank of commander. 18 Jun 1942 Edmund Wooldridge was promoted to the rank of captain. 6 Apr 1959 Edmund Wooldridge was promoted to the rank of admiral. 15 Dec 1968 Edmund Wooldridge passed away.